After the attack on Pearl Harbour the Japanese navy and army won a succession of battles as it extended its conquests into South East Asia and the Pacific. Rather than use its aircraft carriers as lone leaders of separate task forces, as usually deployed by the US, Japan combined them together in a group of four to six to produce a large task force known as the Kidō Butai. This provided superior air cover that overwhelmed the enemy. After the Battle of the Coral Sea in early May 1942 in which the US aircraft carriers Lexington was sunk and Yorktown badly damaged, the Japanese strategy at Midway was to try and lure the remaining US aircraft carriers in the Pacific into their clutches by sending a separate task force to invade the small atoll in early June 1942. The Japanese aim was to destroy the US carriers, to create an extended line of defense, and to demonstrate the potential cost of a war of attrition before new US ships rolled off the production line. Unknown to them, however, the US had broken their codes and knew their general plan. The Japanese had sent four aircraft carriers to Midway, accompanied by 2 battleships, 2 heavy cruisers, 1 light cruiser and 12 destroyers. Waiting for them was 3 US carriers, including the quickly repaired Yorktown, 7 heavy cruisers, 1 light cruiser, and 15 destroyers. In addition, the US had stationed 127 planes on the Midway atoll, in effect creating a fourth static aircraft carrier. At the end of the battle the Japanese had lost their four carriers and a heavy cruiser, the US one carrier and one destroyer. It proved to be a decisive battle, the Japanese subsequently losing every battle until the end of the war. 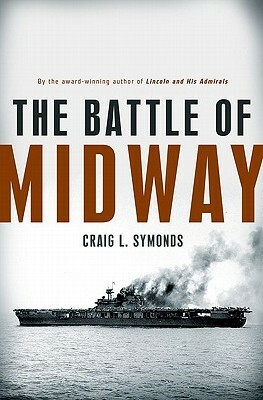 The Battle of Midway provides a very readable and highly informative account of the battle at Midway in June 1942, including some contextual framing with respect to Pearl Harbour, the Battle of the Coral Sea, and the first US air raid on Tokyo. Unlike previous accounts that suggest that the US were lucky to win the encounter, Symonds argues that the US won due to good intelligence, strong leadership, and the element of surprise. Nonetheless, the largely uncoordinated US air attacks on the Japanese fleet proved mostly ineffective until a five minute window when three of the four carriers were hit turning the battle in the US’s favour. Given the number of different threads and personalities involved the narrative could have easily become quite jumbled or bogged down in detail, but Symonds manages to blend the various strands into a coherent, gripping and page-turning story told with an engaging voice. The result is a book which is full of historical detail and biographical sketches of the main actors that clearly explains the battle and its context.